The search for another world with life in our solar system has arguably become the most powerful theme in planetary exploration. While microbial life – the most likely form of life elsewhere in the solar system – itself is likely to be hard to prove with a unified series of past, current, and planned missions to Mars. NASA is developing an orbiter to investigate the habitability of Europa and studying a follow on lander to directly search for life. And for the third time in less than a decade, scientists have proposed a multiple-flyby mission to explore the habitability of Saturn’s ocean moons Titan and Enceladus. The latest proposal, led by European scientists, is called Explorer of Enceladus and Titan (E2T). It builds on the experience gained from two less ambitious previous proposals, led by American scientists, the Journey to Enceladus (JET) in 2010 and the Enceladus Life Finder (ELF) in 2014. 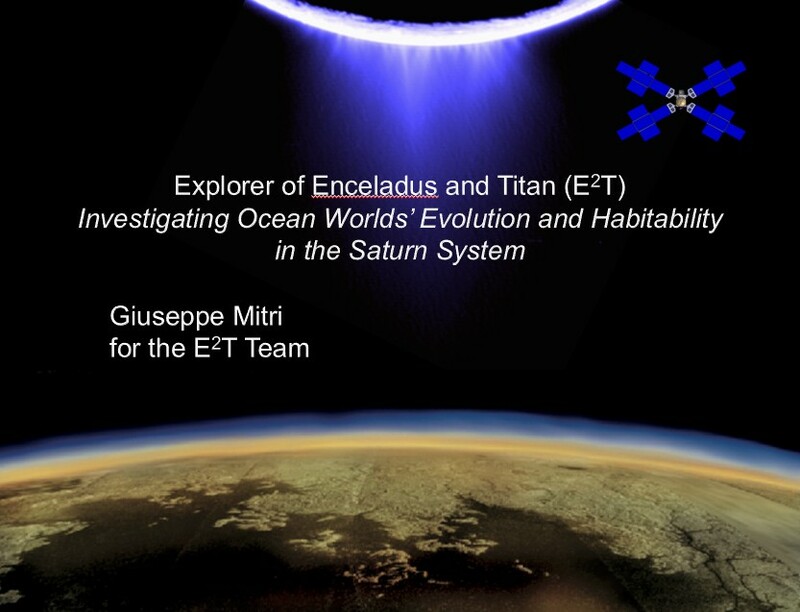 For scientists interested in habitability and life, Titan and Enceladus are obvious targets for exploration. The Cassini spacecraft, which is nearing the end of its thirteen year exploration of the Saturn system, discovered that both worlds have salty water oceans beneath icy crusts. Titan also has a rich stew of organic molecules in its atmosphere that are deposited on its surface and into its methane-ethane surface seas. Enceladus conveniently has plumes jetting samples of its ocean into space. Within the plumes, Cassini’s instruments have found organic molecules and trace minerals suggestive of hydrothermal water-rock interactions that could provide a habitat for microbes. The three proposed missions to Enceladus and Titan would employ relatively simple spacecraft with just two to three instruments. They stand in contrast to NASA’s planned mission to explore the habitability of Europa, another ocean world. The Europa mission will bristle with nine instruments, several of which will produce floods of data that require a high-powered communications system to return the data to Earth. A key difference between the Europa and the Saturn moons missions is the prior history of exploration. Europa was explored by the Galileo spacecraft built with 1970s technology that had a crippled communications system. As a result, NASA’s new Europa mission must conduct its own comprehensive global study of this world. At Saturn, this initial investigation of Enceladus and Titan has been conducted by the highly capable Cassini spacecraft built with 1990s technology. As a result, the next mission to these moons can focus on a few specific questions answerable with two to three instruments. Two of the E2T spacecraft’s instrument would focus on in situ composition measurements. At Enceladus, the spacecraft can fly through the plumes and directly taste the ocean’s contents. At Titan, complex organic molecules are carried to the outermost fringes of the atmosphere where the spacecraft can sample the atmosphere’s chemistry. The E2T spacecraft’s two mass spectrometers would sample material during each passage and determine their composition by “weighing” their constituent molecules. The distribution of the weights of the different molecules can be interpreted to determine the composition of the original material. The spacecraft’s ion and neutral gas mass spectrometer would determine the composition of gasses while the Enceladus Icy Jet Analyzer would determine the composition of ice, salt, and dust particles in Enceladus’ plumes. The two mass spectrometers will measure the nature of the organic chemicals, the pattern of carbon isotopes, the relative abundances of noble gases, and search for amino acids and abnormal isotope rations in organic molecules that suggest a biological origin. The Cassini spacecraft carried versions of both these instruments, but the E2T instruments would have a forty to fifty times improvement in resolution (the ability to distinguish similar molecules) and sensitivity (the ability to measure minute amounts of a substance) over their predecessors. (NASA’s Europa mission would carry similar instruments to E2T’s as will Europe’s JUICE mission to Jupiter and its moon Ganymede). The E2T team has several key questions that the two mass spectrometers would address. For Enceladus, are the materials in the plume most likely from its formation or from current geological or biological processes? What does the composition reveal about the nature of the liquid reservoir (currently believed to be a global ocean beneath an icy cap) and its potential as a habitat for life? For Titan, what are the sources of its volatiles and how they have been subsequently processed? Does the atmospheric composition suggest that the current atmosphere is refreshed by material reaching the surface from the deep water ocean? 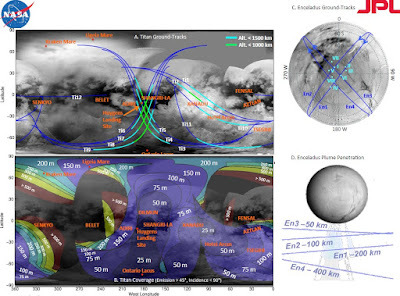 The E2T’s spacecraft’s third instrument would image Titan’s surface and the sources of Enceladus’ plumes (the so called ‘tiger stripes’) in the near- and short-wave infrared. (The instrument’s name spells out TIGER for the Titan Imaging and Geology, Enceladus Reconnaissance camera.) Titan is perpetually shrouded in atmospheric haze, hiding the surface from cameras that image in most wavelengths. However, spectral windows at 1.3, 2, and 5 microns allow a camera to image the surface at several times finer resolution than a similar instrument on the Cassini spacecraft (and also at better resolution than Cassini’s radar images). The images returned by the camera will address several key questions such as: To what degree are sediments produced and transported by fluvial and aeolian processes? How have the rivers and seas of liquid methane and ethane modified the surface? How does the composition of the surface, revealed by the three ‘colors’ of the spectral bands, vary? If the E2T mission is selected as a finalist in ESA’s medium class competition, the team will investigate whether a radio science experiment to study the two moons’ gravitational field could be added. If it is, this experiment will investigate the thickness and mechanical properties of the ice shell at Enceladus’ southern pole where the plumes originate. The gravity measurements would also be used to investigate Titan’s ice shell and the properties of its internal ocean. Comparison of instruments proposed for the three proposed Saturn orbiters that would perform multiple flybys of Enceladus and Titan. The E2T team is proposing a more ambitious mission than did the preceding teams. If Titan and Enceladus are obvious targets for further exploration, what is surprising about E2T and its predecessor proposals is that they were put forward for the lowest-cost class of missions flown by the European Space Agency (ESA) and NASA to explore the planets. The E2T proposal, however, incorporates the lessons learned from those earlier proposals, and scientists from the earlier efforts are members of the E2T team. We aren’t privy to all the details of how the E2T team proposes to fit within the budget cap. This information is a key part of the proposal’s competitive edge. (The presentation on the mission supplied to me by Dr. Mitri, for example, has a number of figures removed because they would reveal too much about key details of the proposal.) However, the team has shared enough information about the mission to reveal some of the key strategies. As described above, the E2T would have limited, focused science goals allowing for a simple, low-cost spacecraft. 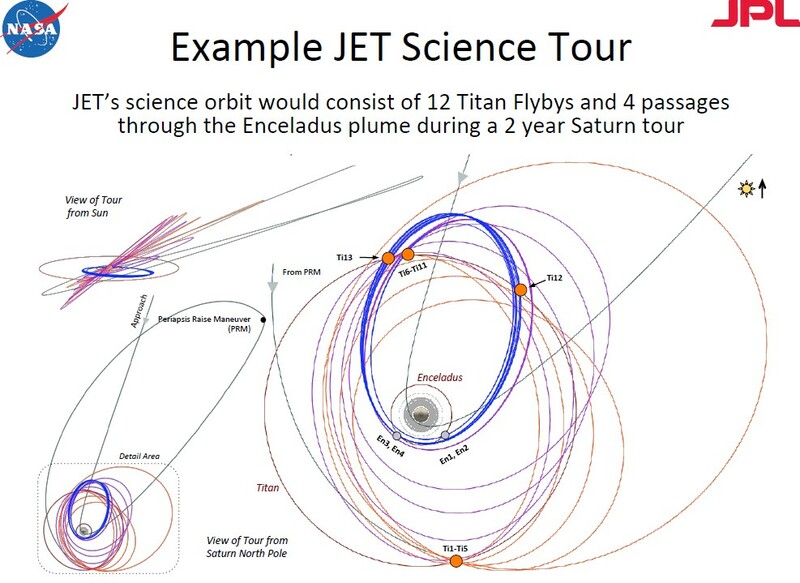 Once at Saturn, the spacecraft would orbit Saturn with six flybys of Enceladus and seventeen flybys of Titan over 3.5 years. In the weeks between encounters, the spacecraft would leisurely return each flyby’s data to Earth. This enables a lower peak data return rate, which ripples through the spacecraft’s design, lowering mission costs. Having just three instruments and substantial time between encounters also reduces the number of mission controllers needed, again reducing costs. The E2T team proposes to use a shared launch to a geostationary transfer orbit with another spacecraft such as a communications satellite. Splitting the launch cost would save the E2T up to 60 million Euros, or enough to pay for much of the cost of mission operations on the way to Saturn. This strategy is enabled by using solar electric propulsion, which allows the spacecraft to propel itself out of Earth orbit and reach Saturn in just six years. 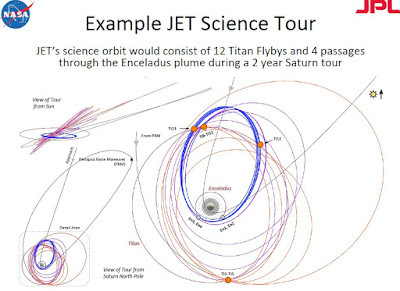 (The JET mission would have required 7 to 8.5 years and ELF ~10 years to reach the ringed world.) Once at Saturn, the spacecraft would use chemical propulsion to enter orbit and set up its encounters. Further cost savings would come from using solar power to generate electrical power instead of the more costly plutonium-powered radioisotope generators. (Although part of the reason for this choice is that ESA lacks the technology for radioisotope generators and US law prohibits NASA from supplying one for a foreign spacecraft.) By using massive solar arrays of 160 square meters (compared to around 70 square meters for the Juno spacecraft), the spacecraft can create a comfortable 620 Watts of power at Saturn. While a portion of this power will need to go to heaters to keep the spacecraft and its instruments warm (around half of Juno’s power is reserved for this), the E2T mission would have ample power margins. The E2T proposal also has another advantage over its predecessors. If the mission is selected by ESA, the team would have almost five years to refine the design before the actual implementation begins. This is more time to fine tune cost savings and to take advantage of advances in spacecraft technology that have the potential to reduce costs. NASA’s Discovery missions, by contrast, have to be ready to begin implementation immediately after their selection. As a result, the proposing teams must have resolved all key design issues at the time of the proposal. The most encouraging sign for me, though, about the E2T concept is that the community of scientists interested in exploring Titan and Enceladus continue to put forth similar if more refined proposals. Preparing for these mission competitions is time consuming and expensive. If the budget math wasn’t close, I don’t believe they would keep coming back. Another fact to consider is that in NASA’s Discovery program, teams often propose missions several times, incorporating the lessons learned each time their proposals are passed over. The E2T team builds on the experience of two previous proposals. ESA will announce the list of finalists for its competition this June, NASA will announce its list in November. If selected, an ESA mission to Titan and Enceladus would launch around 2030 while a NASA mission would launch around 2025. These two competitions likely represent the best hope for fans of these two worlds to see a spacecraft arrive at Saturn by the mid-2030s. With this on Saturn, hopefully Nasa flagship mission to ice giants and New Horizons still going strong behind Pluto I would be happy. And with China getting stronger, hopefully stronger Russia and countries like South Korea, UAE, Iran and new ESA members joining the party this could be really interesting next 10-15 years. many flybys by BepiColombo, solar orbiter and solar probe plus, Venera-D getting serious and with what seems to be capable Indian mission things are looking brighter. And China is bound to have a Venus mission sooner rather than later. Would be great if they (guys and girls at NASA) would crate 360 visualization of Titan. Like they did with those exoplanets recently.